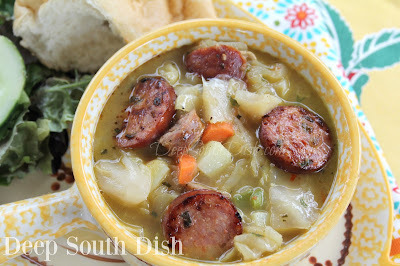 Cajun Cabbage Stew - a stew of ground pork or beef, andouille sausage, cabbage, the trinity of onions, bell pepper and celery, potatoes and carrots, in a chicken or beef broth base with Rotel tomatoes. There isn't anything Earth shattering about this stew. 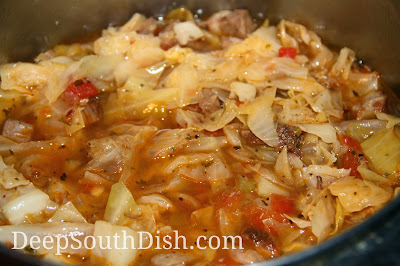 It's just a good ole belly filling stew for cabbage lovers like me, and in fact, if you add in a little bit more broth in the second stage of cooking, you'll have a perfectly acceptable cabbage soup. I've used a variety of meats - andouille, ground beef, ground pork, Italian sausage, chorizo and even leftover brisket, but I like the ground beef and andouille combo the best. 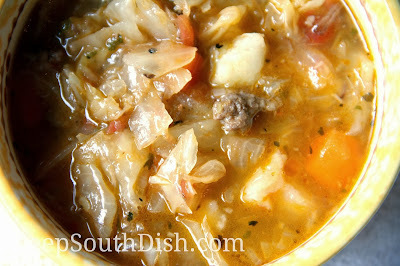 Here in the Deep South, this is usually called Cajun Stew or Cabbage Stew, though if you add in some cooked rice at the end, or serve it over rice, it's a little like an unstuffed cabbage roll stew. Add the rice and increase the bell pepper quite a lot, and you've got a pretty good start to an unstuffed pepper soup. Cajun Stew has the culinary Trinity of onions, bell pepper and celery, plus I like it with potatoes and carrots, and cabbage, of course. It's a simple one pot meal that is classic Cajun cooking. Most recipes will include a can of Rotel tomatoes for a little added flavor boost, though you can reduce the heat by using a can of regular diced tomato instead. Kinda like seafood and Old Bay, I also like to season most of my cabbage dishes with a few shakes of Cavender's, which is a Greek seasoning that contains a mixture of about 13 separate seasonings and all kinds of goodness, but I didn't write it into the recipe since many of y'all may not keep that as a pantry staple. Good ole salt and pepper will do just fine. For the base you can use either chicken broth or beef broth, or water with a base or bouillon. I tend to base which to use on the meats I'm using. Now that's a comforting pot of goodness for us cabbage lovers y'all! I hear that once this tropical system (hopefully) or hurricane (hopefully not) passes this weekend, we might just see some near fall-like temperatures here in the Deep Coastal South. I am ready and this stew would be a great way to celebrate. Here's how to make it. Saute the onion, bell pepper and celery in the bacon drippings or butter until softened; add the garlic and cook another minute. Add the garlic, ground beef and andouille sausage; cook until ground beef is browned. Drain off any excess fat that has accumulated. Add the water, bouillon and Rotel, bring to a boil, reduce heat to simmer, cover partially and let simmer at a low bubble for 1 hour. Stir in the cabbage, carrot, potato, vinegar and seasonings. Cover and continue to simmer another 25 to 30 minutes, or until cabbage and vegetables reach the desired level of tenderness. Taste and adjust seasonings as needed before serving. May serve as is, or over cooked rice. Cook's Notes: When using ground pork, I prefer chicken base and beef base with ground beef. Andouille sausage is a highly spiced smoked sausage that is blended with Cajun spices, adding a spicy kick and great flavor to these dishes. If you substitute kielbasa or other smoked sausages in recipes where it calls for Andouille, it will affect the outcome of your dish and you’ll need to make adjustments in the seasonings you use. May also use spicy breakfast or Italian sausage (casings removed), or ham. For less heat, substitute one (14.5 ounce) can of diced tomatoes for the Rotel and use a milder sausage. May substitute broth or stock for the water and base. Add additional liquid for more of a soup-like consistency. 43 HUNGRY PEOPLE COMMENTED. ADD YOURS! Made this tonight! Very tasty!! Thanks for letting me know Marvin - so glad that you enjoyed it! This is a hearty dish that I will love come late Fall. I think the cabbage would be so satisfying this way. This was quite the tasty dish. I was concerned about leaching all the flavor out of the meat in the long simmer. I may have,but it leached right out into that incredibly flavorful broth. This recipe will serve us well over the winter. Glad you enjoyed it Gina! Made this last week and it was AWESOME! No Andouilli locally, closest we could get was a Cajun seasoned sausage, so will have to find some of the Andouilli elsewhere. Because of that, I bumped up the Cajun seasoning, but would have been even better with the Andouilli. I made this over the weekend and it was a big hit! Everyone raved about how delicious it was...Thanks Mary for another wonderful recipe. I served it with only a big salad and Southern Cornbread.....Tasty mighty good on a chilly evening! I'm so glad they enjoyed it Becky & thank you for taking the time to stop back by and let me know!! Do you think this can be converted to a crock pot recipe? I love your recipes! Hi Amy! I haven't done this stew in the crockpot yet but you sure could. You'd want to reduce the liquid so I'd say maybe 4 cups of water instead - really depends on how soupy or stewy you want it really! Just prep as above except put it all in a 5 or 6 quart slow cooker at the same time and I'd say maybe about 4 to 6 hours on high or 6 to 8 hours on low should do it! I've made this in the cockpot before it came out great! In Oklahoma the weather outside is frightful so I made this in a crockpot today. I sautéed the vegetables and added the ground beef and Andouille sausage. I put water and rotel in the crockpot, added the sautéed vegetable and meat and seasonings. I made a pan of cornbread and it was delicious. It will probably only better tomorrow. I heard! I have family and friends in Dallas and they are planning to hunker down this weekend because of all the ice. Glad you enjoyed the stew - thanks so much for taking the time to come back by and let me know! Stay warm!! Soooo good! The broth is so flavorful and comforting. My husband loved it and gobbled up two big bowls! Thank you for the great recipe. Just made this tonight, and it was wonderful. My husband gobbled up two big bowls. The broth was so rich and comforting. Thank you for the wonderful recipe! Thanks so much for taking the time to let me know Shannon!! I'm so glad that y'all enjoyed it! I would love to make this sometime in the next week. I was wondering though, instead of using the diced tomatoes could I use tomato sauce or paste? My husband cannot eat tomatoes but can handle the paste or sauce. Evidently the acid content isn't as high in those. If I can use one of those, how much do you suggest I use? Tomato paste might be a bit too strong but a small can of sauce would probably give you enough flavor I'd think. It's really not super heavy on tomato, so you could potentially even leave the tomato out & it'd still be a great dish. I'd add in a small can of drained, chopped green chilies too if you do use the tomato since that's what's in Rotel - if you want to have the heat that is! This was sooo good! I made this in my digital pressure cooker in 30 minutes! Thanks for sharing this recipe! You're welcome & thanks so much for letting me know you enjoyed it! Would liked to have seen the nutritional information with the recipe. You will rarely find a recipe blog that has nutritional information, unless they are specifically a diet blog or a large corporate page. If I ever get me a big ole test kitchen and large staff like the big boys, I'll do that! For now, I'm the chief cook and bottle washer around here & it already takes a massive amount of behind the scenes work just to do what I already do & thankfully most of my readers are good with what I do. Fortunately, there are loads of websites available where you can input that data yourself and it'll be customized to what you consider to be a serving size too! Making me so happy with your Cabbage soups and stews. This is another delicious sounding one. Pinning to try!! This was what was for dinner tonight and it was delicious!! I got the wrong sausage and it was still good, bet it's going to be even better next time with the andouille!! The hubby liked it too!! Thank You for another great recipe!! Pinning it to my Tried It & Liked It board. Made this for the second time tonight. I absolutely love it!! Got my sister and her husband hooked on it too. Thanks for the recipe!! Thank you so much Dianne! I just love this stew too!! I have a very nice neighbor and, out of the kindness of my heart, since I had way too much stew just for me, I gave Ray about a 1/2 gallon. A couple of days later he said he liked it sooo much that he had 3 bowls the first night. I was tickled he liked it so much. A couple more days and I was sorry I had so much kindness in me. IT WAS ALL GONE!! Got the ingredients yesterday to make more! Oh my goodness! Well, I'm glad you shared it Dianne. It seems that it made him happy!! Just spotted this recipe today and we're definitely going to have it soon! I think it'll be great after simmering all day in my slow cooker while our crowd is out riding the trails on our 4-wheelers. The weather is supposed to be cool and maybe damp too, this will hit the spot! My Husband hates Cabbage. I fixed this one time Now he wants it ONCE a month. sometimes I leave out the hamburger and put in shrimp. Or i put in Shredded Chicken. I LOVE IT !!! Oh goodness, that IS impressive! I wish I could get mine to eat it - maybe I need to revisit that! About how much would "a few shakes " of Cavender's be? I love the stuff and was looking for a recipe using it. I use it in place of salt & pepper so it's really to taste, but probably somewhere between 1/4 to 1/2 teaspoon or so! Isn't it good? At least I hope that's what you meant! :) I love it too. Enjoy!! Thank you Mary, I use too have a recipe for this and lost it, as soon as I saw this one, I knew it would be delicious.